Whether you have saved up a modest amount of assets or own a considerable estate, you have most likely put thought into how your money, property, and investments will be left to your family, friends, or organizations you support. 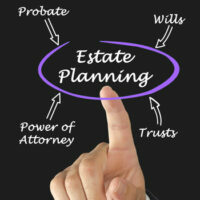 If you created a will, you have already begun the basic process of planning your estate. However, there are many ways in which you can arrange for assets to be left to specific individuals that support your wishes and minimize the tax consequences for your loved ones. A trust is one of those ways. To learn more about planning your estate and utilizing trusts, contact the West Palm Beach estate planning attorneys of the Law Offices of Larry E. Bray. With decades of estate planning experience under his belt, Mr. Bray can help you determine the best ways to fulfill your wishes and ease the burden on your family. You can transfer specific assets into a trust to benefit an individual or group of people. The trust will be managed by a fiduciary or trustee, which in some circumstances may be yourself but is mostly likely another individual. You can create a revocable or irrevocable trust while you are living or have your will designate the creation of a trust upon your passing. By placing assets in a trust before your death, these assets avoid probate and your beneficiary has access to them without waiting on a transfer through your will. Whether or not the assets are taxed upon your death depends on the nature of the trust. During a revocable trust, you retain ownership and control over your assets. You can name yourself the trustee or have someone else manage the assets. You can dissolve the trust at any time. If you pass away while a revocable trust is in place, it usually becomes an irrevocable trust unless you have made provisions for another course of action. However, the assets within the trust will count as part of your state and be taxed. When you create an irrevocable trust, you lose ownership and control over your assets. Once you establish the trust, you no longer have the option to change it or dissolve it. Additionally, an irrevocable trust is not considered part of your estate upon your death, which means it is not taxed. In some situations, you can remain the trustee. However, if you want the tax benefits, you should name someone else as the fiduciary. For estate planning purposes, irrevocable trusts are heavily favored over revocable trusts. Both skip probate, but a revocable trust does not necessarily provide any tax benefit to your estate or beneficiaries. While you may want to pass on money, investments, property or other assets to your friends or family, you may also want to place conditions upon these assets. When you create a trust, you decide how and when the benefits of the trust are to be distributed. You may place conditions on who can receive the benefits and who may become ineligible. You can also place parameters on how the benefits of the trust may be used. If you are interested in learning more about trusts, contact West Palm Beach trusts attorney Larry E. Bray. He has helped individuals with all sizes of estates plan for the future and create trusts that adhere to Florida law. Call today at 561-571-8970 to schedule a consultation.